en Is There a Place for Round and Elongated Spermatids Injection inAssisted Reproduction? Spermatids are the earliest male germ cells with one set of haploid chromosomes. 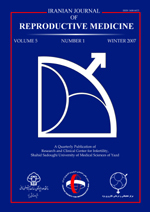 After experiments, mainly in rodents, the spermatid injection was introduced in human assisted reproduction to the treatment of men with non-obstructive azoospermia. Spermatid injection is a technique with particular difficulties that may negatively influence the outcome. The identification, isolation and the assessment of viability, especially for round spermatids, require intensive work and considerable experience. Up to date, it appears that the rates of fertilization and implantation with round spermatid injection are dramatically low and significantly less compared to the use of elongated spermatid injection. The extremely low fertilization potency of the round spermatids led to attempts for their in-vitro culture and maturation. The immaturity of round and elongated spermatids has raised concerns regarding the potential genetic risk for the offspring. Under these facts, a reconsideration of the use of spermatids in assisted human reproduction is necessary.